Achieving a straight smile has never been easier. A metal-free solution to straighten your smile. Gone are the days where your only option of achieving a straight smile was with unsightly metal braces. Now, you can accomplish the same results with Invisalign® in our Seattle dental office. These clear, plastic aligners gradually move your teeth into their proper positions without the metal. 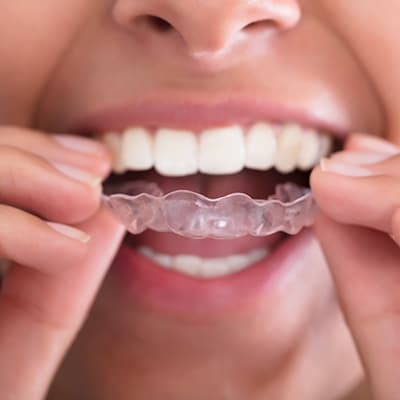 Invisalign® can straighten all types of teeth: overly crowded teeth, gapped teeth, crooked teeth, underbites, overbites, and crossbites. It’s the perfect solution for both adults and teenagers. During your consultation with Dr. Larrance Commons, you will discuss your smile goals, create a treatment plan together, have a 3D digital scan of your teeth (no goopy impressions), and review your potential smile outcome. This scan will also create a series of custom-fitted aligners. During treatment, you will wear your clear aligners for at least 20 hours a day and change them every two weeks. Treatment time can vary, but the average length is 12 months. Unlike metal braces, your aligners won’t need adjusting so you will only occasionally check-in with Dr. Commons, saving you time! Once your treatment is complete, you will have a beautiful, straight smile. Another bonus: If you want to add more sparkle to your smile, you can whiten your teeth under the same roof. Invisalign® is changing how people smile; see what it can do for you by scheduling a consultation with Dr. Commons today. These clear aligners are virtually invisible and people may not even notice you are wearing them. You can still eat, drink, and take selfies how you want. Aligners don’t take much effort to clean, and you can brush and floss your teeth as you normally would. Want more reasons to love Invisalign®? Check out our infographic: The Ultimate Patient’s Guide to Invisalign. WHY CHOOSE SEATTLESCAPE SMILES FOR YOUR STRAIGHT SMILE? Dr. Commons has been helping families smile for more than 20 years. He understands his patients’ desire for a beautiful, straight smile…and their frustration at the thought of metal braces. That is why Dr. Commons is excited to offer Invisalign® clear aligners at our downtown Seattle dental office. Convenient Hours: Seeing a dentist should be easy! We offer before-work appointments, are open by appointment on Saturdays, and will schedule same-day appointments when available. 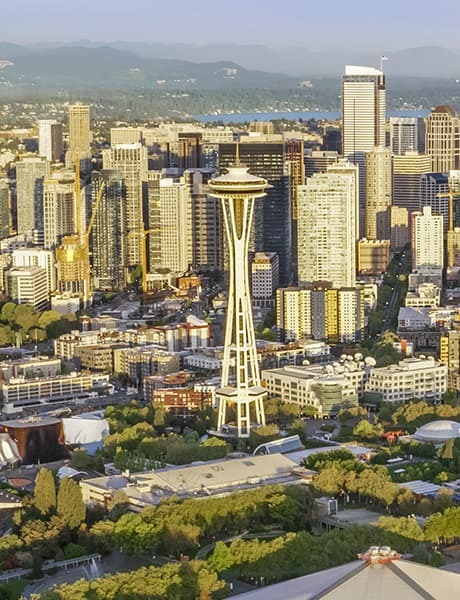 Accessible Location: Located right by the Space Needle and Amazon, we serve Seattle, South Lake Union, Belltown, and the surrounding areas. You can get to us by walking, bus, car, or Uber. Click here for directions. Technologically Advanced: Ensuring we fit in in Seattle, we use the latest technology to provide multiple treatments with precision and minimal discomfort. Comprehensive Practice: Adding Invisalign® to our growing list of dental services only better allows us to care for your oral health. We focus on your unique needs and provide high-quality, long-term solutions. Our practice is designed around our patients and their personal goals. We believe in open communication and want to ensure your dental goals are successfully and comfortably met. Generally speaking, no! These aligners are custom made to fit within your gum line. However, when you start wearing a new set of aligners, you may feel a little pressure or discomfort for the first few days. Eventually, it should wear off. If you are uncomfortable at any time, just give us a call 206-724-0188. After you eat or drink, brush your teeth before putting your aligners back on. At night, rinse your aligners and lightly brush them with your toothbrush. These methods should keep them fresh and clean before you switch to your new set. How long is Invisalign® treatment? 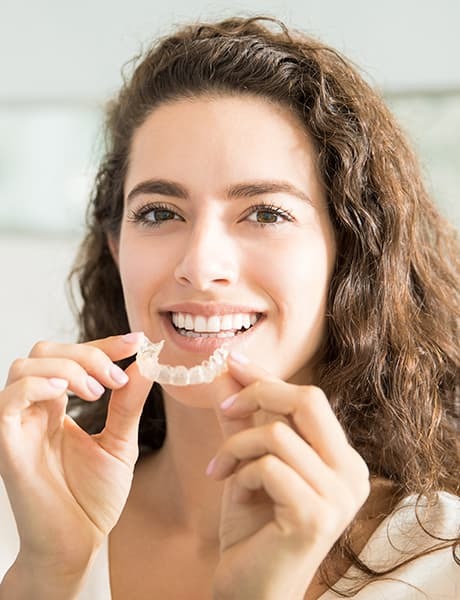 Most patients’ treatment is 12 months (18-32 sets of aligners) with ideal patient cooperation – meaning you must wear your aligners at least 20 hours a day. However, treatment length can vary based on your unique situation. To find out exactly how long your Invisalign® treatment would take, schedule a consultation with Dr. Commons today. The average cost is $5,000 – same as traditional metal braces. Do note: This is just an average cost, and it often varies depending on an individual’s unique situation. Don’t let cost stop you from smiling. We believe in being transparent and can help break down financial costs. We accept many dental insurance plans and some plans cover the cost of orthodontic treatment like Invisalign®. You can more answers on our new patient page. To find out exactly how much your Invisalign® treatment would cost, schedule a consultation with Dr. Commons. What other dental services do you offer in Seattle? Do you know someone who wants straight teeth? Refer them to us and they will get $100 off their first visit. Schedule your consultation and start your smile journey today!